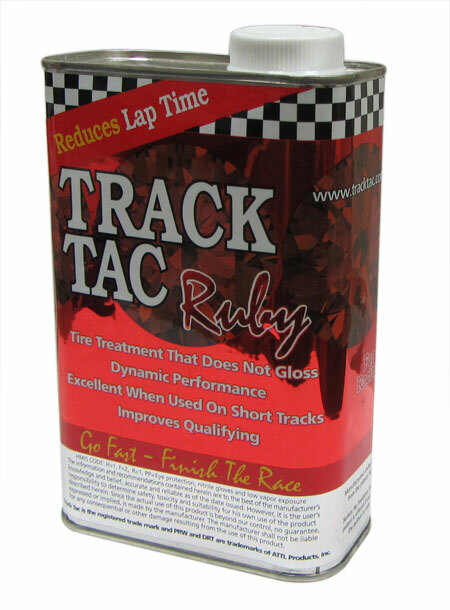 Track Tac® Ruby will drop the hardness of the tire when cold, between 5 to 10 depending on number of coats applied. Average is ~7 points. Track Tac - Ruby: Will last for a full night of racing and increase the life of the tire. It also works with both natural and synthetic rubber. It also can be used track side as is, or cut as a Pre-Race Wipe for high grip tracks. Directions: For a Saturday Night Race! Monday: Monday night before the race using a foam bottle, paint roller, sponge, or some other method completely cover the tread of each tire with 3 or more coats of Ruby. Tuesday: Tuesday night before the race, repeat what was done on Monday night. Wednesday: Repeat procedure for even a softer tire. If racing on dirt, wipe down the tires with PRW-Orange between heats, if possible.